Lines indicating where the paper should be cut to produce the correct size, however the cut may shift up to 1/16 of an inch in any direction. No copy should stop at the trim marks line, as this copy will definitely be either over or under cut per the tolerance value above. 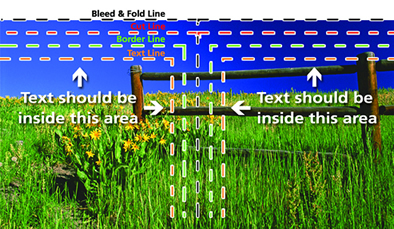 If it is your intention to have the images not reach the edge of the printed piece when cut, then it must stop at the Active Zone limit shown. If it is your intention to have the images reach the edge of the printed piece when cut, then it must go all the way to the bleed limit shown. "Bleed" is the term for printing that goes right to the edge of the paper. If you wish to have coloured backgrounds or images continue to the edge of the product they must continue past the trim marks to the full bleed margin. If they do not continue to the full bleed margin you most likely will end up with white strips along the edge of the product due to cutting tolerance. Printed pieces that have a white border or white around the edges, DO NOT bleed. The size with bleeds will be 0.25" larger than the final cut size in both dimensions. If any items are placed past the limit of the active zone may be chopped off. For printed products produced on heavier grades of paper that need to be folded should not have dark colors such as rich black, dark brown, burgundy, purple or other such deep dark colors as the paper will crack on the folded line, and the white of the substrate will be exposed on the cracked surface which will make the product look imperfect. If such dark colors are necessary for the product design and cannot be avoided, then it is advised that the product be scored prior to folding, otherwise any liability of the paper stock cracking shall be borne entirely by the client. 1. All images must be provided in CMYK (cyan, magenta, yellow, black) colour mode. NO RGB images should be sent as the automatic conversation will definitely have colour shifts that may be unpleasant. Exception: if your images are ONLY Black & White, DO NOT save them as CMYK. Save them in GRAYSCALE Mode. Process colours and PMS colours must be specified in application colour palettes. Important: Make sure that your TIFF images WERE NOT saved with "LZW Compression" Make sure that your EPS images WERE NOT saved with JPG Compression Encoding. All images in any file format must have a minimum of 300 dpi (dot per inch) resolution. The images designed for the web are done at a low screen resolution of 72 dpi. Printed images need to be created at 300 dpi or there will be a substantial drop in the image quality. HiRes images must be saved in CMYK, Bitmap or Grayscale format, NOT RGB or indexed colour. Bitmap formats must have 1200 dpi resolution and save as TIFF. Do not use "hairline" rules, use 0.25 Point instead. Do not trap application files. IMPORTANT: Once your design is complete, please be sure to remove the template layer from your files to avoid printing it on the final piece. Neglecting to remove this layer may result in a delay of your turnaround time, requiring you to re-upload your corrected files. All designs rendered will be forwarded to you in the form of a low resolution Acrobat PDF proof sent to you via email for approval or revisions. Once approval to print is granted, your designs will be printed and shipped to you.